(Note: As of Feb 7, there is one spot left in this retreat! 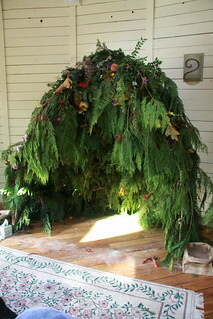 April 25-28 at Indralaya on Orcas Island, Read more information here. These retreats are an opportunity to gather and support each other in releasing grief and healing our tender hearts. There are so few places in this culture where we can bring our strong emotions, our deep grief and anger. Many of us yearn to unburden ourselves with others, but find ourselves alone with our grief all too often. This is a place where your tears and heart-ache will be held in a sacred container with support and witnessing. The retreat includes talking circles, singing, ceremony, sharing food and quiet time in the woods. The heart of the retreat is an evening ceremony inspired by Sobonfu Some by Therese and Laurence, who were blessed to participate in a number of her Grief Rituals. 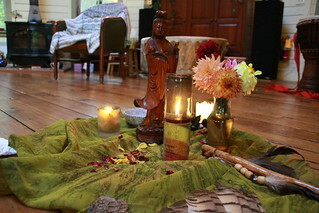 The spiritual framework for this retreat includes time-honored and earth based modalities such as invoking the energies of the 7 directions, utilizing the power of drumming and chanting, the belief that the natural world is a rich place of inter-connection with “all our relations,” and the importance of working with the unseen realms, including our ancestors. Overnight accommodations: Saturday night the ritual may go late, so those living on the east side of Puget Sound or a farther drive than Poulsbo should plan to stay here on Bainbridge Island. Lodging at Sacred Groves is limited and is already full-up for the March retreat.….about half the participants need to find lodging elsewhere. Other lodging options on Bainbridge can be found through Airbnb. The nearby Quality Inn (10 minutes drive) may be willing to offer a reduced rate….please inquire. Facilitators: This retreat is blessed to have 4 big-hearted facilitators, each bringing unique gifts to the group: Thérèse and Tere collaborate with Laurence Cole and Mary Hart. Thérèse, Tere and Laurence have been partners in offering this grief work for over a decade; Mary joined the team in 2016. Fees: The fees for the early March retreat is $300 for Saturday and Sunday. Lodging is additional whether you stay at Sacred Groves or elsewhere (please inquire). For those coming to the sweatlodge on Friday afternoon, the fee is $350. Fees include meals on Saturday and Sunday. If these fees are a hardship for you, please talk to us. We do offer a limited number of partial scholarships to those in need; if you would like to request such, please write to us about your circumstances. We are also open to installment payments. Read more about our philosophy around fees by clicking here. Thank you for your generosity! A $100 deposit and an email is requested to confirm your commitment. To make your deposit on-line (using PayPal or credit card)…..click the “donate” button below or you can mail a check (for deposit or full balance) to 9255 Holly Farm Lane, Bainbridge Island WA 98110. In addition, please let us know if you need lodging. Once we receive your deposit, your name will be added to the list of attendants. More info will be sent once we get your deposit. Feel free to call or e-mail if you have more questions. If you cancel less than a month prior to the retreat, we retain $50. Click here for photos of past Grief Retreats.